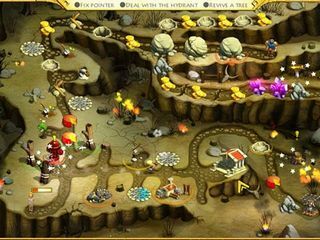 12 Labours of Hercules IV: Mother Nature Collector's Edition is a great adventure in the anciant times, where magic and extraordinary abilities are at hand, and your enemies are human-like gods. Hercules is feeling better and ready to work! Hercules and his wife are up against the witherd nature of their land. After the embarassing defeat of the so called gods Hercules is no longer popular up in there. He was poisoned by somebody and spent about a year in bed felling bad. Now that he is finally well there is a lot of work to do in his land. A great beast has been unleashed to destroy his land. What a great premise for a time-management game! You and your wife Megara are into it together restoring one part at a time. The colors of the game match the transformation of the wastland into a beautiful fertile land again. There are several challenging in every level. First, you want to accomplish the tasks within the given time limit. You can adjust that according to your skills. Second, you don't want to forget about a puzzle piece in every level. But it important to find it before you click anywhere and start the level. If you finish a level fast enough, you will be rewarded with a castle piece. Don't worry if you fail at first, you can replay any level. And there are achievements to earn throughout the game. 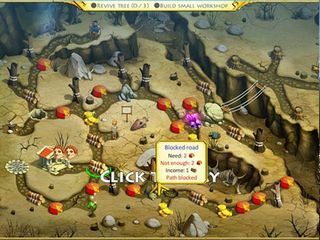 It is a fun and challenging game with a reward to see the results of your work. This is 12 Labours of Hercules IV: Mother Nature review. .